As many of you probably know … I’m a shutterbug … I put myself in the ‘serious amateur’ category. My camera of choice is a Canon 7D … and I have two lenses currently. A Canon 70-300 zoom and the lens that came with the camera and a Canon 28-135 “kit” lens. Both have in lens image stabilization and are quite adequate for my uses. That said … I’ve heard great things about Canon’s “L” line of lenses. These are higher end lenses that have better quality optics. For my current trip to Hawaii, I planned on taking a lot of pictures of surfers and whales (it is whale season in Maui). In the past, I’ve had reasonably good results with my current lenses, but wanted to try out some a higher end lens. A bit of digging around on the internet and I found LensRentals.com … they had a wide range of lenses available and, as an added bonus, they would ship the lens you rented direct to your destination. This entry was posted in Shutterbug and tagged canon, hawaii, lenses, maui, photography on 24-February-2012 by David. Over the years, I’ve owned a number of camera bags … some better than others. I thought I would take a few minutes and give you a rundown on the camera bags I’ve seen and what I thought of them. 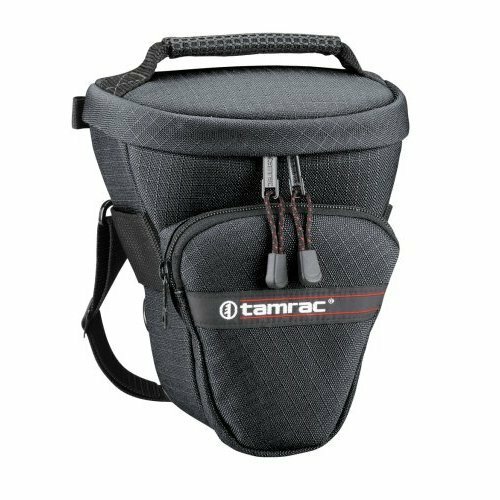 The first bag I had was a Tamrac 515 … it’s a nice little bag that can comfortably hold a single camera with a longish lens. Nothing more than a 300mm zoom though. It’s got a pocket in the front to hold film or filters. It also has a see thru pocket in the top for other accessories. This bag worked quite well for me when I only had a single lens and not a lot of accessories. After I started purchasing more lenses, filters, and other accessories that I needed to carry with me, I figured a new bag was in order. 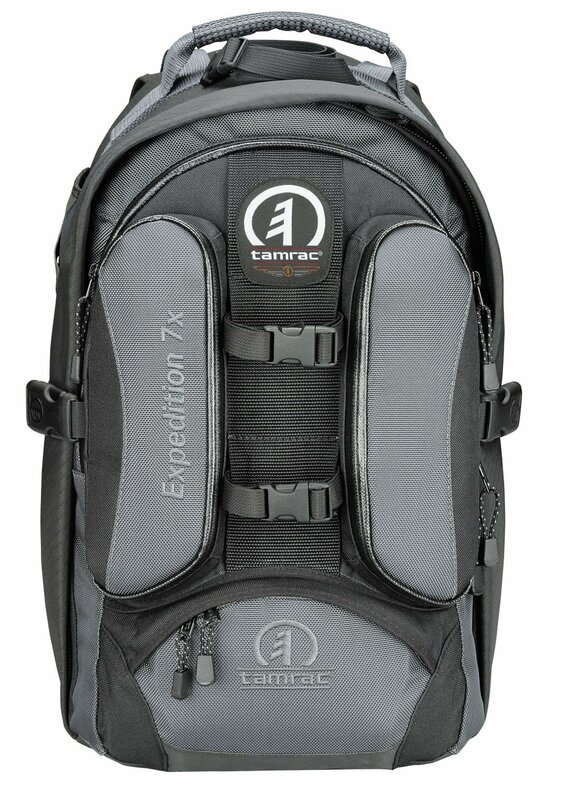 I looked at a number of bags, but decided that the Tamrac Explorer was a good choice. 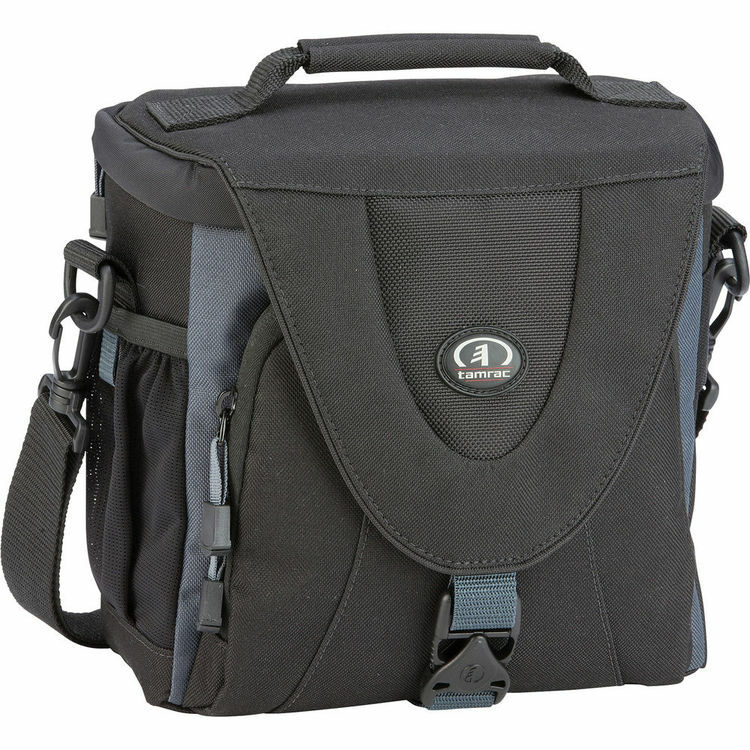 This bag has partitions to hold a SLR camera body with a short lens, plus spaces on the sides for other lenses and accessories. It also has a nice zip open top cover for easy access. The front pocket has space for filters, memory cards, and such. Once I started getting even more accessories, I found that the Explorer wasn’t quite big enough. Time to find another bag. 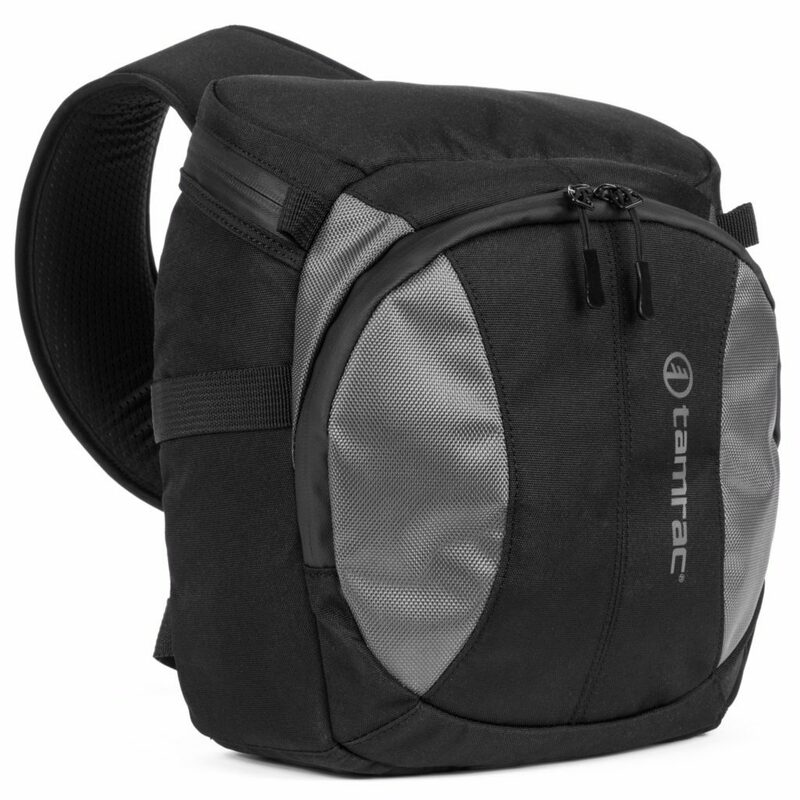 My first thought was to get a backpack style camera bag … something that could hold a lot of accessories. I gave the Tamrac Expedition a try. While this bag certainly has a lot of space available, I found it cumbersome to use. There was no really easy & quick way to get to the camera without unslinging it from your back and unzipping it. I was worried that items in the bag were going to fall out (which is obviously not good for things like lenses). Since I only had the Expedition two weeks, I decided to return and try something else. When the sales person handling the return asked why, I explained what I didn’t like about the Expedition. He recommend I try one of the new Tamrac Velocity bags. Plenty of space, easy to carry, and easy to access items inside. I haven’t had a chance to use the Velocity much yet … but I think it’s got good potential. This entry was posted in Shutterbug and tagged accessories, camera bags, cameras, photography on 22-June-2007 by David. Back in October, I wrote about having forgot to clean the filter on my camera … well, it turns out that the stain on my filter wasn’t actually causing the spot on my pictures. There was actually a stain on the filter… but the spot on the pictures was actually being caused something on my cameras CCD sensor. I didn’t realize what the problem was until I took pictures with different lenses. I took the camera to Wolf Camera (where I purchased it) to get it fixed. Hopefully all I have to do is pay the $65 cleaning fee. Update 4/25: Sadly, Wolf hasn’t finished the cleaning … I’m getting kind of antsy, as there have been a number of nice days I would have liked to go out and taken pictures. I called today to check on the status, but they couldn’t tell me much. The guy who normally deals with repairs & such is out. This entry was posted in Shutterbug and tagged camera, cleaning, lens, photography on 30-March-2007 by David. Waterfalls do present themselves as a wonderful and challenging subject matter to photographers. Firstly they’re beautiful places, secondly they are often in tricky lighting situation and thirdly they’re a dynamic subject as they’re moving (and of course movement means a challenge but also a real opportunity for a more dynamic shot). I really like photographing waterfalls … this is a pretty good introduction to how to get dramatic shots. This entry was posted in Shutterbug on 27-November-2006 by David. Well, I learned a hard lesson today … make sure your optics are clean before taking pictures. I spent two days taking a huge number of pictures … and, after transferring them to my computer, I found that there was a water stain on my UV filter … and that stain showed up on EVERY shot. A few of the shots are recoverable … as the stain is in a contrast area … but the majority of the really good shots are a total loss. This entry was posted in Shutterbug on 15-October-2006 by David. The Chicago suburbs seems to have a distinct shortage of camera shops. I’ve been looking for a new tripod to replace my old one (that broke). I went to Helix in Lombard … they had a good selection, but nothing that I really liked. Wolf Camera in Schaumburg had a someone more limited selection … including one that I really liked. It had everything I was looking for … light weight, good size when extended, and very small when collapsed. But it cost $249. Of course it was made of carbon fiber, which was why it cost so much. A bit of research found another camera shop in Glen Ellyn … P.J.’s Camera shop on Rosevelt Rd. They had a few tripods, including one that I liked. It’s a Manfrotto 718SHB … it’s reasonably light, good height, and very small when collapsed. The only problem was the shop didn’t have a spare mounting bracket (for Ginny’s camera). I had to search the internet to find a place to get one. This entry was posted in Shutterbug on 27-September-2006 by David. The following is a post I made to the LUNI mailing list regarding digital camera recommendations … I thought I covered a lot of good suggestions, so I figure I would post it here too. What brand of digital cameras do people on the list use? Right now, I have one by Fuji, but it’s a bit on the cheap side and I am thinking of getting a new one. I’ve had great luck with Canon EOS digital cameras. My Digital Rebel (300D) was great … although the frame rate & buffer was a bit lacking (3fps with a 4 frame buffer). My new Canon 30D is even better at 5fps and a 30 frame buffer. Of course Canon makes excellent optics … so the pictures come out great. My personal recommendation would be to go with a digital SLR … that gives you the most flexibility. You can be in fully automatic mode, or play with shutter priority, aperture priority, or manual modes. One thing to look out for is the storage media and connection mechanism. Personally, I like the compact flash medium. Secure Digital isn’t bad either. I would stay away from the memory stick cameras, as the media only works in a small selection of cameras. CF memory is nice because it’s widely used and there’s a lot of ways to transfer data from the card. You can use a USB reader or PC Card adapter for a laptop. The connection mechanism is also a consideration … don’t get a camera that requires a dock, as you might have to take that around with you all the time. Get a camera that has a *standard* USB connector. My dad has a camera that connects with USB, but the connector is non-standard on the camera side. So if he looses the cable, he has to go to the vendor (Olympus, I think) to get a new one. All my Canon digital cameras (300D, 30D, and Powershot A85) use mini-usb connectors on the camera side. If I loose the cable, I go to an office supply store and get a new one. Also get something that has good battery life … nothing worse than running out of juice when that perfect shot comes into the frame. I’ve got a spare battery for my 30D and the A85 uses AA’s. This entry was posted in Shutterbug on 7-September-2006 by David. I bought a new camera this weekend … a Canon 30D. As much as I really like my Digital Rebel, the frame rate has been really bothering me … especially when I’m trying to take wildlife photos. I can only get 3 frames per second … with a 4 frame buffer. This means that I can only get a little more than a seconds worth of shots before the camera has to dump it’s buffer to the flash card (which can take a long time). The Canon 30D can do 5 frames per second with a 20-30 frame buffer (depending on the image quality). Plus, I can take pictures in raw mode and it will write two image files … a RAW file and a JPG. It’s got a great hand feel, and good controls. I really like it. The picture above is from a photo safari Ginny and I took to the Morton Arboretum this weekend … pretty nice, eh? Oh yeah, it also has a setting that won’t let me take pictures without a flash card inserted. This entry was posted in Shutterbug on 23-July-2006 by David. I took this picture of Riley this weekend … I was going for the depth of field with Riley in the background, slightly out of focus, and his cat toys in the foreground. Came out pretty well, I think. I’m need to play around with that stuff a bit more … but I’m getting better at getting the picture I’ve got in my head. This entry was posted in Animals, Fun, Shutterbug on 10-July-2006 by David.